The pressure of climate change, environmental degradation, and urbanisation, as well as the widening of socio- economic disparities have rendered the global population increasingly vulnerable to the impact of natural disasters. With a primary focus on medical and public health humanitarian response to disasters, Public Health Humanitarian Responses to Natural Disasters provides a timely critical analysis of public health responses to natural disasters. 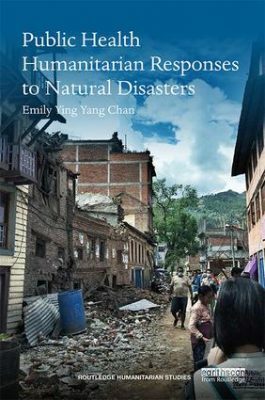 Using a number of case studies and examples of innovative disaster response measures developed by international agencies and stakeholders, this book illustrates how theoretical understanding of public health issues can be practically applied in the context of humanitarian relief response. Starting with an introduction to public health principles within the context of medical and public health disaster and humanitarian response, the book goes on to explore key trends, threats and challenges in contemporary disaster medical response. This book provides a comprehensive overview of an emergent discipline and offers a unique multidisciplinary perspective across a range of relevant topics including the concepts of disaster preparedness and resilience, and key challenges in human health needs for the twenty-first century. This book will be of interest to students of public health, disaster and emergency medicine and development studies, as well as to development and medical practitioners working within NGOs, development agencies, health authorities and public administration.